Summary Four-bay dual core Freescale-based NAS with loadable apps and cloud access. 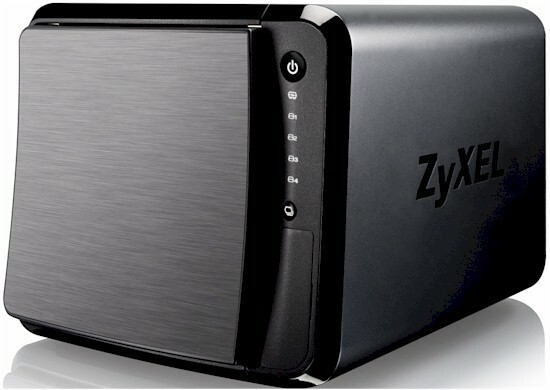 The NAS540 4-Bay Personal Cloud Storage is ZyXEL's first four bay NAS. Like the two-bay NAS325 V2, the NAS540 offers lots of features and decent performance at a nice low price. The NAS540 offers all the features you'd expect in a 4-bay NAS. It supports RAID 0/1/5/6/10 and RAID5 + Hot Spare volumes and accepts both 3.5" and 2.5" SATA drives in hot-swappable bays. The NAS540 is the first ZyXEL product with "personal cloud" features. So we'll be taking a look at these features and the slightly updated UI based on ZyXEL's NSM 5.0 (NAS Station Management) OS. Like many other 4-bay NASes, the drives in the NAS540 are mounted vertically. The NAS540 measures 7.48" x 8.85" x 6.29" and weighs about 4.4 lbs without disks. The callouts below show the front and rear panels. It's worth noting that of the four least expensive 4-drive NASes we'll be including in our comparisons in this review, only the NAS540 has three USB 3.0 ports as well as an SD card slot. It also has two Gigabit Ethernet ports - a feature shared only by the recently reviewed D-Link DNS340L. The front panel is relatively plain. It features a power on/off switch, a system LED and individual LEDs for each drive. The One-touch Copy/Sync allows you to initiate the copy or sync function of memory devices inserted into USB or SD ports. The front panel SD slot and 1 USB 3.0 port are covered by a hinged plastic door. The front panel that covers the drive bays is secured to the case with four corner-mounted magnets. The rear panel has two additional USB 3.0 ports, dual Gigabit Ethernet ports, a Kensington security slot and a power input jack. The callouts for the power port contains an error. The NAS540 is powered by a 19 VDC 4.7 A external "brick" power supply. The external power supply helps reduce the heat inside the case. ZyXEL touts the 120 MM Smart fan as a contributing factor to the NAS's low noise. Indeed, in our tests, the NAS540 earned a "low" noise rating. Not identified in the rear panel callout above is a reset switch. It's located just above the power socket. The NAS540 is powered by a 1.2 GHz dual-core Freescale FS1024 (M86203G12) SoC with 1 GB of DDR3 RAM and 256 MB of Spansion Flash. The Gigabit Ethernet ports are a pair of Realtek RTL8211E. Since there are no other Freescale powered four-bay NASes in our current NAS Charts, I'll be comparing three other least expensive four-bay NASes, i.e. the ASUSTOR AS-204TE, Thecus N4310 and D-Link DNS-340L. Key components for all four products are shown in Table 1. The image below shows the NAS540 main board. In the center, the chip with the silver cover is the Freescale SOC. The Realtek RTL8211E Gigabit Ethernet controllers are on the left side of the board adjacent to the Ethernet connectors. The image below shows the drive backplane with four SATA connectors. It plugs into the connector near the upper left corner of the main board above.